For decades, education has been an easy institution to define. It consisted of acknowledged literacy skills, definable bodies of knowledge, and pedagogies for teaching willing students within information-scarce learning environments. 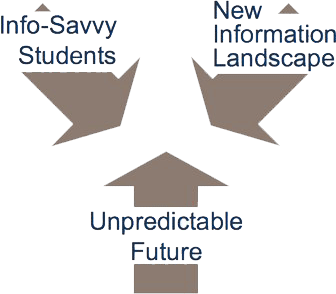 Today, for the first time in decades, we are questioning our notions about teaching and learning as we adapt to a world that is changing faster than our ability to react. We are struggling to rethink what it is to be educated, to reinvent where it happens, and redefine our roles as educators — as the line between teacher and student appears to blur. This is a new feature, where I will add additional notes that come out of this presentation and conversations about it.